When a female Bengal tiger trespasses into territory claimed by a larger male tiger, a battle ensues. Native to India, Bengal tigers are usually solitary animals that prefer to live and hunt alone. They scent-mark their territory to keep competition away and will fiercely defend it against any encroaching tigers that dare hunt on their land. 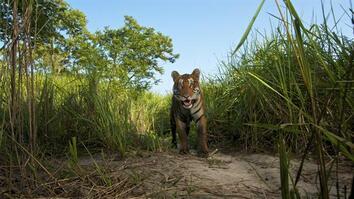 For this female tiger, the dry season poses a challenge when it comes to food. Well camouflaged, she comes across a herd of deer, but they are protected by lookouts. Suddenly, the monkeys sound the alarm—the only predator bigger and stronger than her has arrived. A male tiger is not pleased that she has been hunting on his land and attacks. Wisely, she surrenders and moves further into the dry, empty forest. Her dedication pays off, however, when she come upon a small lake teeming with life. When a crocodile disrupts the calm, she seizes the opportunity and catches herself a meal. 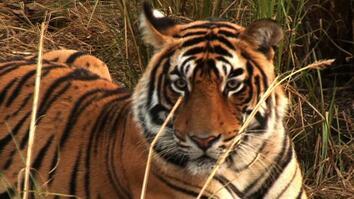 Due to hunting and deforestation, wild tiger populations have fallen from hundreds of thousands to less than 4,000.